M. L. (MaryLu) Tyndall grew up on the beaches of South Florida loving the sea and the warm tropics. But despite the beauty around her, she always felt an ache in her soul--a longing for something more. One day, she picked up her old Bible, dusted it off, and began to read. Somewhere in the middle, God opened her hardened heart to see that He was real, that He still loved her, and that He had a purpose for her life, if she'd only give her heart to Him completely. For the sake of her ailing mother, Marianne Denton becomes engaged to Noah Brennin---a merchantman she despises. But as the War of 1812 escalates, Jonah's ship is captured by the British, and the ill-matched couple learns vital information that could aid America's cause. So sorry, no review on this one either... but I have read quite a few of M.L. Tyndall's books and these I particularly enjoy! I'm not exactly sure why except that her writing just seems to flow for me. And each story has enough of a twist that you don't really know how it's all going to work out. My favorite kind of book! 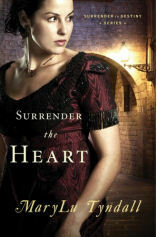 If you would like to read the first chapter of Surrender the Heart, go HERE.